Built in 1874 on the north end of Five Mile Beach in 1874, at 39° 00' 00" latitude by 74° 47' 00". Its purpose was to mark the entrance of the inlet for the coal trade and other small steamers navigating the coastal waters. The lighthouse was completed on April 16, 1874, and equipped with a fourth order Fresnel lens made by P. Sauter of Paris, France. It was first illuminated May 11, 1874. It is built in a style known as Swiss Gothic. It is the only one of this type on the East Coast. Threatened by the encroachment of the south side of Hereford Inlet, its foundation was damaged in a severe storm on August, 1913. As a result the lighthouse was moved inland (150 feet to the west) in 1913. In May, 1938, there was a fire in the lighthouse that began in a bedroom and quickly spread to the nursery causing extensive damage. Just a few days earlier, Keeper Ferdinard Heinzman had been awarded a pennant for efficiency. He was busy painting the exterior of the lighthouse when the fire broke out. Used until 1964, it was discontinued and superseded by a nearby iron tower. This iron tower stood from 1961-1983. 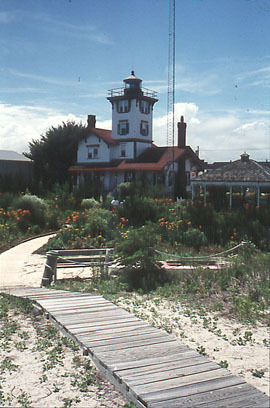 The lighthouse was used for a time by the Marine Police, until the Marine Police were transferred to a nearby State Police building. No longer needed Department of Environmental Protection backed a plan that became the basis for a 20 year renewable, no cost lease with the City of North Wildwood in 1982. The city began restoration, operation and maintenance of the lighthouse. The lighthouse was listed on the National Registry of Historic Places on September 20, 1977. In 1986, the light was relighted and is still maintained by the Coast Guard.